Classical meets dance – live! The first weekend of March saw Audio Plus provide a complete bespoke audio solution to Club Class for their return after an 8 year break. The night featured a 40 piece live orchestra in the legendary Maidstone Studio 5 presented by DJ royalty Judge Jules. Club Class CEO Sergio Bienati came to Audio Plus requesting a bespoke audio solution for the event, the only requirement? It had to be Funktion-One. Audio Plus are no strangers to live classical concerts, with previous work including Orchestra In A Field festival and the Royal Philharmonic, we were able to quickly designed a bespoke audio package perfectly tailored to the challenges of an amplified orchestra. Audio Plus system engineer Mark O’Neill opted to use Resolution 5 with PSM series fills and F series low frequency support. The FOH system comprised LR flown arrays of three wide, two deep Resolution 5 with Resolution 4D downfills. The sub array was a hybrid system comprising LR stacks of F218’s to cover the bass range down to 60hz and a spaced cardioid broadside array playing from 60hz downwards. This hybrid array was designed in order to help reduce the on stage bass, a task which it performed with great success. PSM18’s were used as infill for the front audience area while PSM12’s were utilized as outfills. The entire system was processed through an Audio Plus custom built LAKEDrive system and powered through Lab.gruppen PLM20K44 amplifiers on a Dante network with analogue redundancy. O’Neill’s console of choice was a SSL Live L500 Plus running 2 x ML32.32. In order to achieve the best sounding results from the live orchestra Audio Plus monitor engineer Kris Hayes opted for a silent stage with the entire orchestra and singers playing on in ear monitors. The only speakers on stage were a pair of Funktion-One PSM318’s used as DJ monitors driven by an Audio Plus ES8 touring amplifier rack housing two MC2 E100’s and an XTA DP448. Control was handled by a DiGiCo SD7 running 2 SD Racks. The challenge of mixing a live 40 piece orchestra and DJ playing classic dance music is getting enough level on 40 open mics. The first step, have a silent stage which was achieved by keeping the orchestra on IEMs, the second step was to close mic as many of the live instrumentalists on stage, this meant over 30 DPA 4099’s were chosen to close mic the strings, brass and saxophone sections, with AKG 451’s covering the woodwind section. The 8-piece percussion section was mic’d using a combination of Shure, Sennheiser and AKG dynamic and condenser microphones. Vocalists used Shure UR4D transmitters with Beta 58a capsules. Click and cue tracks were needed to ensure the orchestra kept in time with the DJ, this was achieved by using a fully redundant QLab system which talked to both monitors and FOH on a redundant Dante network. The QLab system also provided the lighting department with LTC Timecode cue’s according to their requirements. Audio Plus also provided a five station ASL comms system for live communication during the show. The entire show was multi track recorded using an SSL Live Recorder and stems were shared to monitors through the SSL stage rack via MADI link. 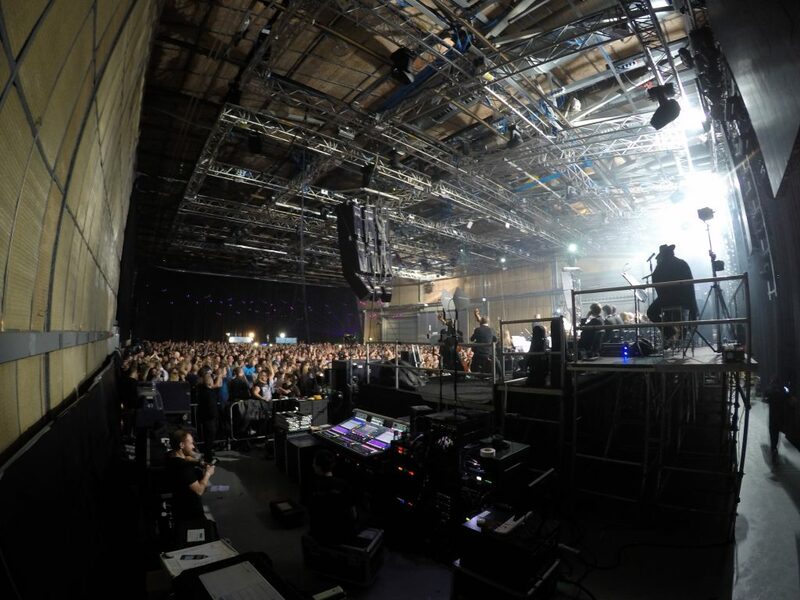 The complexity of working with a live orchestra is not to be underestimated and the audio requirements for such a complex set up can not be either, however the Audio Plus team took the challenge on board and delivered a complex bespoke design that was executed flawlessly resulting in a fantastic evening for all involved.